“There isn’t a single windmill owner in Holland who doesn’t have a second job–for when there is no wind,” British television personality Johnny Ball once said. An interesting point perhaps, but it’s not just the windmill owners who need a backup job: The windmills could use one as well. So why not put these cool energy-makers to another good use? When there’s a movie, surely there’s a way to write in a windmill scene, isn’t there? 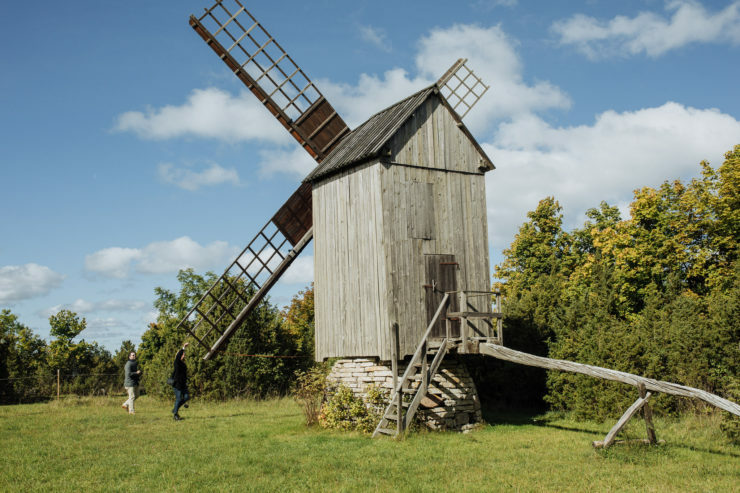 So if you’re looking for a way to get a windmill into your story line, consider an Estonian windmill, and nowhere is there a better spot than the island of Saaremaa. Windmills are the true symbol of Saaremaa, and in the 1800s, all larger farmhouses had one of their own. The best known windmill, actually a whole bunch of them, is in Angla, a half-hour drive from Kuressaare, the capital of Saaremaa. There are five windmills in Angla, four of which are typical wooden windmills characteristic of the area. They can be turned in any direction, and they work well as long as there’s wind blowing from that direction. The largest of the Angla windmills, however, is a typical Dutch design, except it’s wooden, and Dutch windmills are typically made of stone.. But who cares about that detail as long as it fits the part? Another notable windmill is on the neighboring island of Muhu, the third largest island in Estonia, which is connected to Saaremaa by a causeway. This windmill is called Eemu, and it stands a half mile from the causeway in the village of Linnuse. The windmill is easy to spot from the side of the road, driving from Kuressaare to Kuivastu, the port that connects Saaremaa with the mainland. Although of little economic use today, this windmill is a classic example of the oldest type of European windmill dating back to the 12th century. There are other equally striking windmills on mainland Estonia. One of them is called Seidla, part of a manor of the same name. It was built in the 18th century and is one of the few Dutch-style windmills that have been preserved with all of their fittings–a unique setting indeed. 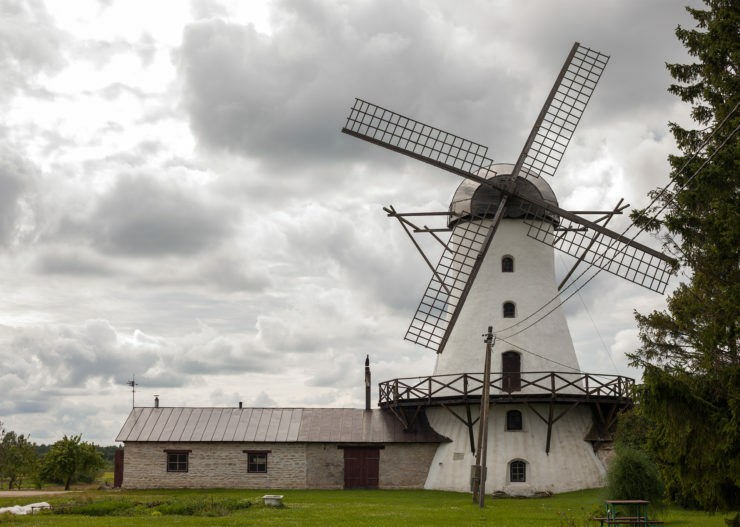 In case you need a windmill to mill flour during or between takes, you need look no farther than Ervita, a village in Järva Parish in north-central Estonia. The mill here is made of limestone and is quite typical of those on the Estonian mainland. Its diameter is 37 feet at the bottom, nearly 20 feet at the top, and a little over 30 feet high. This restored windmill is operational, too, so if you like, you can feed your crew traditional Estonian bread made from its flour. Your movie could even be about a cockeyed Spanish knight-errant and his loyal farmer turned squire, as Estonian windmills can accommodate all sorts of plots. Add to that you’re probably going to be eligible for a hefty cash rebate of up to 30% of your production costs, savings that will come in handy if you are going to create a lavish Don Quixote flick.